Learn how to change the paper size before printing using Canon printers. Before printing a page type it is necessary to verify compatibility with the printer, although this support it, there are many types of paper but not all printer can process. When we send to print, to exit the document focused on their margins, must be sent from the computer, the same role you have in the printer. The inkjet printers Canon, allows us to print at least 30 different sizes of paper. It depends on what the printer, you can confirm this information in the manual of the printer or printing preferences, right where we will setup. By default these printers are to print A4 paper type, one of the papers most used in offices and homes, if you need to print a different role in this must program the printer before. We can choose to make a permanent configuration or only for one document at a time, it all depends on the need you have. 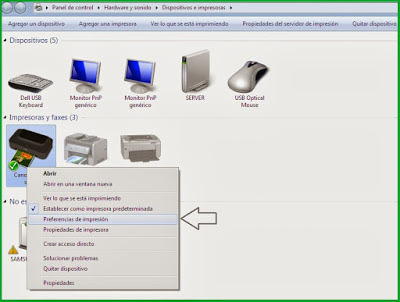 For example, if often only print A4 documents but occasionally print job documents is made, the settings are recommended for printing documents in trades only when needed. This procedure will allow us to configure the printer to print a size in all document, we can only print again A4 or any other format, when the configuration is changed, with the same process. Getting to print devices depend on which operating system you have, but when it comes printers is the same procedure for all. The first thing to do is right click on the image of the printer you want to configure. They appear a number of options available on where select printing preferences. At the top of the window that opens will see a series of tabs, we must select the tab #3 from left to right, page setup. When we have selected the type of page to be printed in the lower right of the window we apply an option appears, you click and then select OK.
Our printer prints now on by default, the paper size you have selected, you can change whenever you want to format, available in the list. We can say that the process is almost the same, the only difference is where we do the configuration. When you want to print a document us a print screen will appear, such as from Microsoft Office, this gives us the ability to configure what you want to print. In this dialog as in printing devices appear to configure options, printing preferences is also available. As shown in the top right we see the option of properties, when we click us the same printing preferences menu appears. We make the same settings for page size permanently.